A couple of you have asked for my apple cake recipe and this seems like the easiest way to share for everyone to see! Mix and let stand 1 hour. Mix well, fold in apple mixture. Bake in greased tube/bundt pan at 350° F for 1 hour. Mix in small saucepan and bring to a boil over medium to medium-high heat. Boil 2 minutes, then spread on warm cake. Pretty easy, no? The hardest part is probably peeling and chopping the apples! And now on to quilting news! 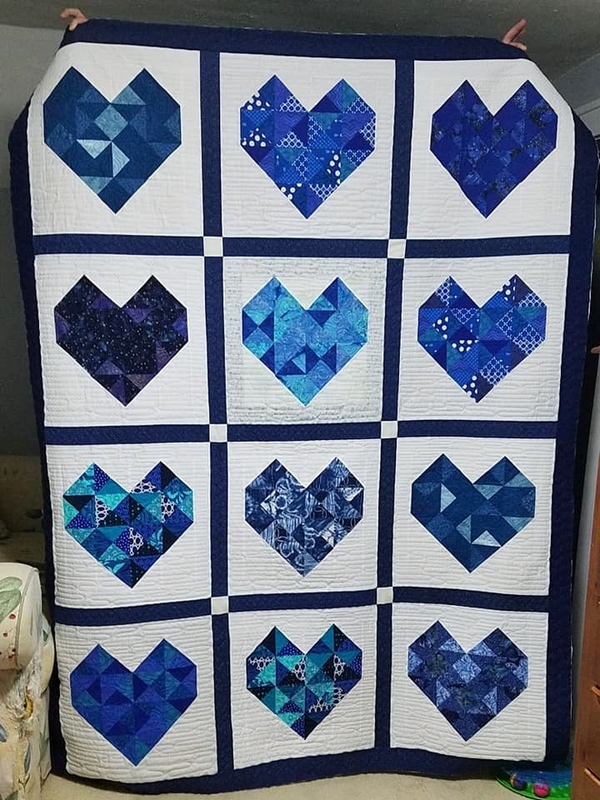 Quite a while ago (actually over two years, checking back on my blog), I found a gal who was asking for quilt blocks of a specific design to be donated and she would construct tops to be given to families of fallen police officers. I thought it was a great idea and a nice block and brought the idea to my guild. We have one member with a former state trooper hubby and another with a fairly newly inducted state trooper hubby and many more with military ties, so there was a good response. I collected 14 blocks in the next few weeks. But when I tried (repeatedly) to contact the gal, I got no response. I was frustrated, but figured I'd keep trying. And then the blocks got buried in a stack of too much other stuff. And I forgot. As I was cleaning and tidying through my UFO finishing last year, I found the blocks again. And went looking. This gal had never again once mentioned these blocks/quilts/project. What should I do? I told my friends I'd take care of getting these where they were supposed to go! I felt awful that I had, basically, lied to my friends. And then, a few weeks ago, Country Log Cabin Quilter mentioned a charity called Quilts for Cops where she planned to send some quilts. I checked it out and it seems a perfect alternative. (You can also find them on facebook.) While they send quilts to officers injured in the line of duty (rather than family they've left behind), the idea is still much the same - thanking those who do such dangerous duties - and I was excited to get these blocks sewn into a top! There is a recommended size range, so I worked a little with some graph paper and did a little math to figure out I would only need 12 of the blocks and some fairly minimal sashing. The difficult decision was made and the blue-that-won't-go-away was selected as sashing fabric from my stash. 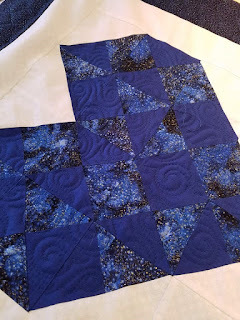 The blocks are large, so the quilt came together fairly quickly. Even if there were LOOONG seams from the very start. 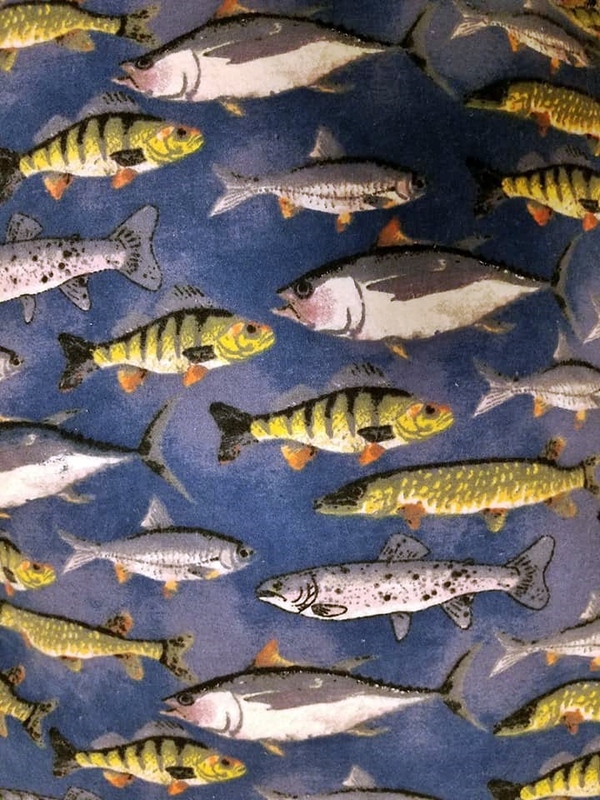 Unfortunately, I took no photos until I got it onto the longarm! I only had to purchase a back and the group mentioned that flannel backs are great, particularly for officers based in more northern locations. Well, JoAnn's has a fabulous sale on flannel, so what better timing! When I saw this, I was done shopping. 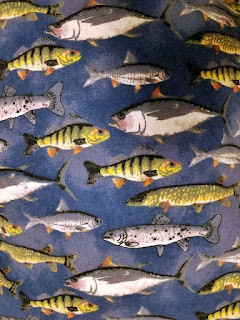 My hubby would love this print (even identified the fish when I showed it to him!) and since many of these quilts go to men, I figured it was a winner. It could be for an outdoorsy lady, too, but this is definitely NOT girly! I struggled some with how to quilt these large blocks and what color thread to use, but finally just started the loading process and figured it might come to me! 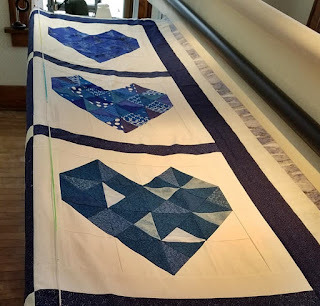 Part of me wanted to do some ruler work in the hearts, but there are quite a few seams in these blocks and some of them are pressed more nicely than others. So I needed something that could creatively miss areas that might be extra troublesome. 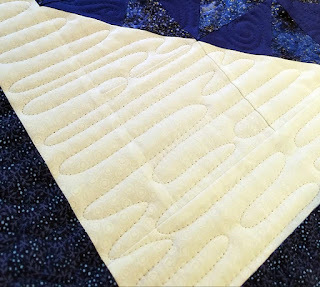 And once I realized I could do a whole heart without moving the quilt on the frame, swirl-hooks became the plan. Using blue, of course! It's not too easy to see here, but this was one of the easier blocks to see what I was doing. My eyes hurt from straining by the time I was done - with only 12 hearts! But I got them done. I also needed to fill in the background! Pale grey on white-ish? This isn't the best, but I've only done this once or twice before, and not using it to work around oddly-shaped pieces - working in a rectangular or square space is MUCH easier with this pattern. I'd like to say I got better as I went, but I think they're all about the same. I didn't get a photo of the borders, but I did a wishbone/figure-8 design in all the borders and sashings. And then begged my hubby to help me get a quick photo! It's 64x84" and does not yet have binding. The group asks for diagonal-pieced binding sewn on by machine. Neither of those are in my comfort zone, so I cut the binding strips to the requested width and included them in the package with the quilt. 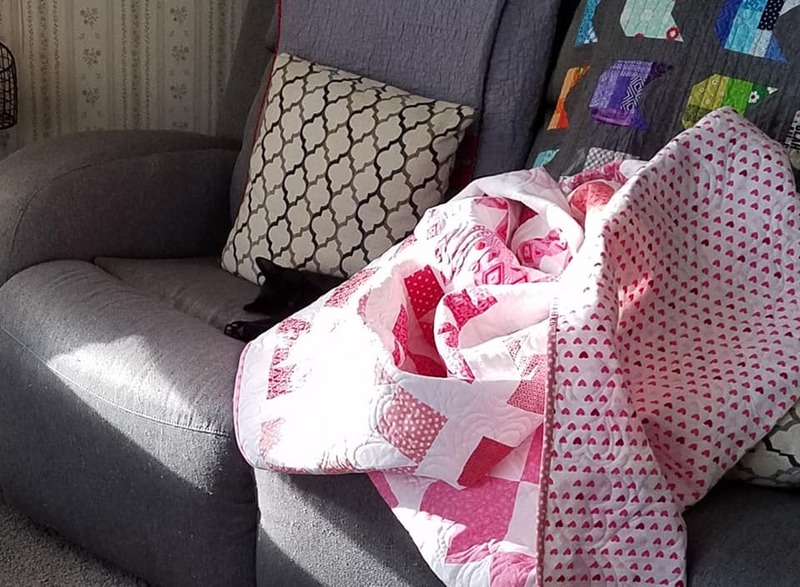 Once it was done, I contacted the charity group, making sure the quilt was acceptable, and they were thrilled to have it. In the box I also included the two blocks that weren't used, hoping they can use them for another project. Earlier today, I made a special trip out to the post office and sent the quilt on its way. It may take up to a week to get there, but that's okay. They know it's coming, but it's no rush. I hope this alternate proves acceptable to my friends. And I hope this will comfort and warm someone while they heal...let them know there are folks out there who will never meet them that care about their well being and appreciate their choosing such a dangerous profession. Because of this and work, no progress has been made on the log cabin blocks, but I'm headed to the sewing room shortly! ...Freddie is there, kinda half-under the quilt, enjoying the sunny day we had a few days ago. Thanks for the cake recipe, it sounds yummy. I think I will make it to take to our next Bunco night and the ladies will love it! Hey, it has apples in it, it has to be kinda healthy! The donation quilt is perfect, someone will love receiving it and I hope all your friends who donated the blocks will be happy, too. My DH is retired from 31 years on the PD, my son is a Sgt. on the PD and we have lots of friends who are police. I can tell you it will be greatly appreciated wherever it goes. Love seeing Freddie cuddled in your Valentines quilt, so cute! 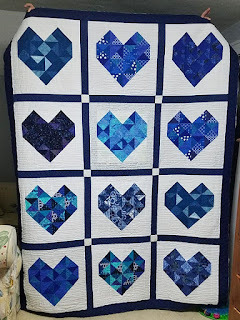 The blue heart blocks are very pretty, and you did a great job putting them together and then doing a beautiful job of quilting them. All participants in the project should be very pleased! I'm sure the recipient will be! ---"Love"
I was surprised to see my blog named in your post!! I'm glad you are sending the quilt to Quilts for Cops. It is definitely a worthy cause. It seems like the police have more than their share of injuries and It just makes me sick to hear about police getting shot on purpose which is happening too many times these days. I probably wouldn't have seen Freddie if you hadn't pointed him out! That cake recipe is a winner! My dad will love it! For all its long journey your guild’s donation quilt to the families of first responders is such a heartwarming gesture. I’m sure it will be much appreciated. Little Freddie looks like he has the best spot for a catnap. The pinkies made me chuckle.